In a surf set you can summarize different parameters and save these with a name. Every surf set has a unique name. When you are surfing you can select between the different surf sets. Create a new Surf Set. Assignment of a new name. Delete the displayed Surf Set. Note: If the description isn't displayed, then you enter the browser in Options/‌General/‌Browser. Stores revised Surf Set permanently. At the next start, the adjust settings are used again. The dialog is closed. Apply revised Surf Set temporarily. The surf mode determines where the resources are loaded from internet or cache archiv. With reuse you can change the refresh time provided by the publisher of the resource. Pages are requested with their URL from the local cache archive in the offline mode. Online mode corresponds with normal browsing but available files in the cache archive can be re-used. 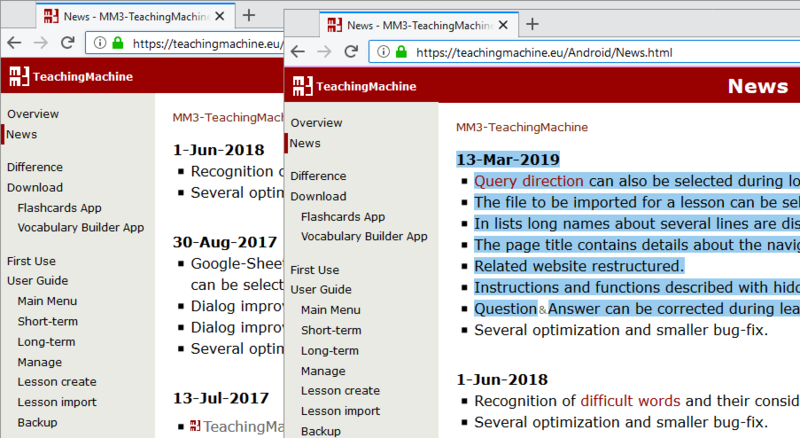 At HTML files and other resources e.g. pictures the re-use can be adjusted in many ways. With re-use you can change the refresh time provided by the publisher of the resource. Files available locally will never be requested again from the internet. The locally available files are used in the adjusted time period. The optimal setting depends on the application. With a daily newspaper, time of expiry should not be set to more than one day, for example 12 hours. This has in general proved to be a favorable setting. Similar behavior like with corresponding settings in your browser. In this mode the respective files are always requested as new from the internet. Furthermore you can define that a file is reused also at the same size. Note: Not every server informs about the file size before the download. A server isn't reachable and the called file locally available, so will be used with the local file. This corresponds to the setting never new for the re-use. The whole WebAssistants cache consists of folders (specified by topics) where the resources of the internet can be saved. The cache archive can get arbitrarily large (except for restrictions of the operating system). It is necessary to use one cache archive at least. The left column lists the enabled cache archives of the displayed surf set. All other cache archives are listed in the right column. At this all entries written in grey aren't used in any surf set. Adds a further folder to enabled cache archives. Moves enabled to disabled cache archive or reversed. Deletes a disabled cache archive displayed in grey. The folder and the contained resources aren't deleted in the file system. 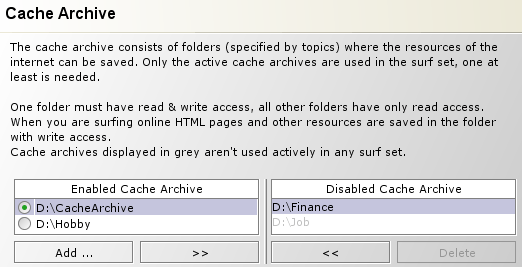 A folder must have read & write access in the column of enabled cache archives. All other folders have only read access. When you are surfing online the HTML pages and other resources are saved in the folder with write access. This folder is marked with a green point. In the example above, four folders are given: The folder /CacheArchive/ and three folders specified by subject (Hobby, Finance, Job). By exchanging the entries you can compile any number of specific folders, which can also be stored on another storage device, like CD ROM. If you assign several topic specific surf sets with only one directory, then you can select between these topics by browsing. Moreover, the WebAssistant also can be started from a CD ROM. It is not necessary to install the program on a hard disk! Only a virtual machine must have been installed on the computer or in the network. You reach a higher flexibility by the separation from program folder and cache archive as well as use of several archives. The correct processing of very long URLs in addition requires, that at least 230 characters can be used for the path and the file name with the WebAssistant. Therefore use only folders for the cache archives which are located on partition level (Root), please. The maximum path name for this shouldn't be greater than 20 characters. Very long URLs are often used for advertising. You also can be filter the advertising with Surf Set/​Filter/​Advertising. One cache archive may not contain any other cache archives! Efficient use of the archive by marking and highlighting words. All links are marked green to available resources in the cache archive during surfing. So you get a fast summary of all resources, are already archived and thus locally available. The marking can be used in the mode offline and in the mode online. The marking per default is green or can be defined with a stylesheet. Only the locally available resources can be shown in this mode. Therefore the markings simplify surfing considerably. Are you interested in the content of not available resources? Change to the on-line mode. Any added URL is collected here. Automatically about the protocol function Options/​General/​URL History/​Surf Mode Offline/​Any not found URL. In this case every URL is collected. The marking shows to you, which resources you have already visited. This completes the history function of the browser. If you are interested in the differences in a page since the last archiving, then you activate this function. 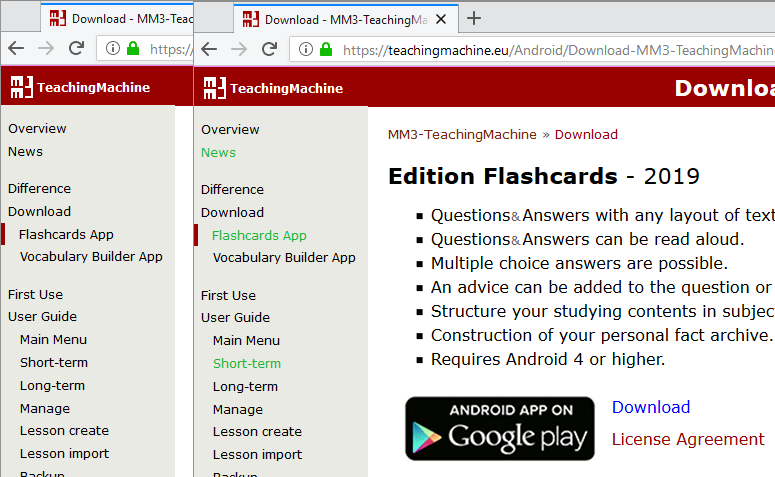 When surfing in the on-line mode newly available texts are then marked. The marking per default is blue or can be defined over a style sheet. Current page is loaded completely with all resources even after the page was already left. All files referenced by links are loaded. A HTML page is loaded with all resources. All files referenced by links as in depth 2 are loaded. A HTML page is loaded with all resources. All further depths corresponding. If you liked to archive a whole page (interlinked pages) automatically, you use the utility mirror. These settings determine which and how resources will be archived. At activation of the option Store resources the files are stored in the directory with access to write. If you stop the download in the browser, the resource is not save. The Prefetch must be deactivated (Depth 0). The parts which are not download are not available by offline surfing. It is securer not to use the WebAssistant in the field of confidential information. You hereby can prevent that e.g. advertising images will be loaded. For these not relevant resources result no cost for data transmission time and memory space. For automated filtering, restrictive operation has been chosen to make sure you are not denied content you may find interesting. According to our analysis it may make sense not to select the general browser setting, not to load images. We would rather advise to specify subdirectories and subdomains from which GIF images must not be loaded. If there are content of entire domains or subdomains you are not interested in, you can also specify these. The WebAssistant can be used for many different purposes. It is difficult therefore to give any specific recommendations for filter settings. Possible applications may concern family filters or ad filters. For advertising purposes, GIF images are often loaded from specific subdirectories (e.g. advertising, adverts, ads) or other files from specific subdomains (e.g. ads). 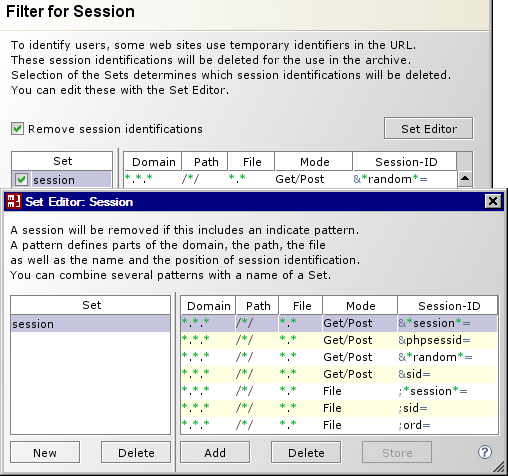 The filter setting prevents files to be loaded from the areas specified. 1 New Create a new Set. 2 Delete Delete the selected Set. 3 Add Adds a character pattern to the Set. 4 Delete Delete the selected character pattern. 5 Store Save the selected Set with all character patterns. Character patterns with a red font are deleted because other patterns include these. 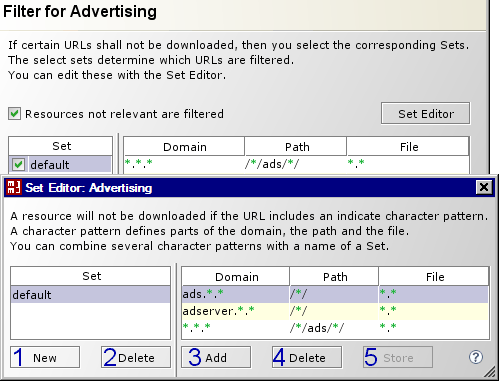 Providing a large variety of options, the WebAssistant has not been conceived as an ads filter. It must also be noted that advertising is a considerable driving force for the development and maintenance of many products and does provide information. We have therefore refrained from a pre-configuration as an ad blocker. This is also why the program has no option to use image sizes for filtering. These same sizes are sometimes used to serve the offer. Filtering in this respect will therefore not contribute to a more efficient use of the internet. To identify users, some web sites use temporary identifiers in the URL. If an archive is used, these sites can therefore not be used to full extent. These sessions must be deleted for the use in an archive. For the configuration you therefore take care which identifications are used at your visited web pages. Please specify these as Session Filters. You can work on such a set with an Set-Editor and use in every Surf Set. The detailed structure of the filter is described: Filter for Session. The browser communicates with a web server via the protocol HTTP usually. The protocol HTTPS is used for a secure communication. Protocol FTP is used to download big files usually. Sometimes a proxy in addition is still used by your provider or in your local net. A proxy inserted behind the WebAssistant can be specified here for the protocols HTTP, HTTPS and FTP. The fastest data transmission is obtained with protocol HTTP 1.1. This is supported by the WebAssistant. The browser should also be configured with this option (see Browser Proxy Configuration). You can thus restrict the process of passing data on your browsing habits. Standard setting causes the browser to transmits the present URL (reference) to the HTTP server by requesting another URL. This setting can be kept, or a reference can only be transmitted if it is in the same domain. At standard setting, the browser will transmits its name to the HTTP server. This setting can be kept, or you can append an additional name. If the options is activated, cookies will be transmitted to the browser respectively to the server. Files encoded with the HTTPS protocol are stored as decoded files! If you do not activate this function, the data only are conducted by the WebAssistant. For complete deactivation switch off the HTTPS proxy in the browser (see Browser Proxy Configuration). We recommend this for transmission of confidential data. This function needs an internal port. You can change this port, see Options/​General/​Internal Port. For the use of the protocol HTTPS an other configuration is necessary. The implementation of the protocol consists only of a subset. Therefore some HTML pages cannot be displayed.